Bluestock tacks has become most popular Android App Player for PC because it's user friendly and is working fine on 2Gb RAM PC's. There are many Android app players but they need more system requirement and are more in size than bluestacks, so people prefer to use bluestacks other than youwave e.t.c. The old version of bluestacks was working fine but the latest version has some problems. The biggest problem in latest version of Bluestacks is you get black screen after using it for 1 or 2 min and then you need to restart it. So today we are going to describe you how to fix bluestacks black screen. When i installed latest version of bluestacks on my laptop after using for 1 min i got the bluescreen i though it is problem with my system .i tried to downloading new bluestacks setup but i got the problem again and i gave up. Then after 1 month i got need of Bluestacks and i installed it on my friends laptop i got same blackscreen problem on their also. Then i though it is not problem with my system it is problem with bluestacks so i stated to find fix for it. 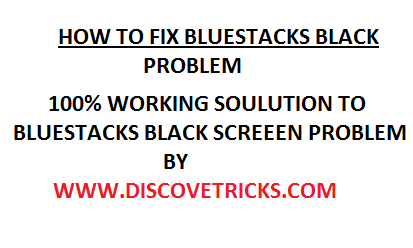 I searched on internet "fix to bluestacks black screen" but after long time i found 4 Methods which are driver update, reinstalling buestacks which worked for some users but none of the methods worked for me then i focused on blusestacks and i found that it is happening when i keep bluestacks inactive for 10sec then i get the black screen . it is actually a feature of bluestacks which is bluestacks goes to sleep mode after inactivity of 10 sec and this can be fixed by simply installing screen timeout app from play store. I tried this with few of my friends and i got 100% success and now i m going to share this tutorial with you. 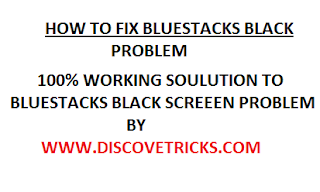 I have also discussed other 3 methods for fixing blustacks blackscreen. I prefer you first try method 1 on which i got 100% success. Methods to Fix bluestacks black screen. 1.) Download our DT Screen Timeout App Here. 2.) Install it on Blustacks And open it. Some time while installing any software on your PC you got crash on installer and some files not getting installed on your PC so you may have faced the same problem . Try to re install the BlueStacks App player. This problem of black screen of bluestacks maybe because of some specific App. For this restart Bluestacks and try to launch other app if that app is running means your previous app that you were trying to run has the issue. So try to reinstall the app and restart your bluesracks to fix bluestacks black screen issue . Method 3: Problem with Nvidia Graphics Card. 1) First open Nvidia graphics control settings. 2.) Then go to Manage 3D Settings >> Program Settings >> Add Buttons >> Add Bluestacks Frontend >> finally turn off the Threaded Optimization Option. These where some methods for fixing BlueStacks black screen error hope one of it have a worked for you if none of the above have a worked for you try to send report to BlueStacks on their official website. in finding things to enhance my site!I assume its ok to make use of a few of your ideas!! It's the best Deer Hunter 2016 hack tool I have used so far. My spouse and I stumbled over here coming from a different page and thought I may as well check things out. I like what I see so now i am following you. Look forward to going over your web page yet again.